Kicking off a software migration initiative is always a balancing act. 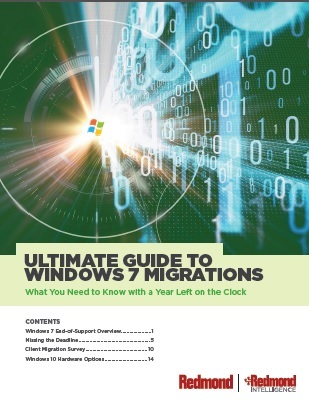 It’s no different migrating your organization to Windows 10. To be successful you require detailed information regarding your software and hardware assets. Most importantly, you need to know if a given asset is Windows 10 compatible. A poll of over 300 IT pros reveals their confidence on everything from current email gateways to security awareness training. Despite overwhelming evidence worldwide that phishing is a growing threat vector, the results show a shocking disconnect between the email threat landscape and IT pros on email security. Learn more. Read this Tech Talk paper to find out how an all-flash solution can stave off disaster by providing near-constant data access and fast and flexible recovery with virtual, physical and cloud data management. Learn more. Read this report on the public and private cloud market for guidance in determining which approach to take and how web-scale networking can help those considering a move to a private cloud. Learn more. Read this paper to learn about the controller-less Software Defined Network (SDN) that achieves SDN’s goals without a centralized controller and free of proprietary technology by utilizing networking as code. Learn more. Read this white paper on Hyperconverged Infrastructure to learn how disaggregated, open networking solutions can provide data center operators with the agility to build a customized network that fits their business needs. Learn more. Microsoft Azure Reserved Virtual Machine (VM) Instances are an effective way to reduce your Azure spend. Reservations enable you to make an all upfront payment towards your compute costs, thereby providing prioritized capacity. Learn more. Choosing Azure revolutionizes your environment's agility, simplicity, and innovation, but have you achieved the cost savings you expected? Discover 10 ways you can reduce your spend in Azure. Learn more. What does the future of secondary data and apps look like? Read the new e-book, Disrupting the Realm of Secondary Data, for quick strategies to revolutionize the way you store, manage and move secondary data in hybrid cloud architectures. Learn more. Today, hybrid cloud is increasingly the norm, and enterprises are challenged with ways to have visibility, manage and make use of all their data – both on-premises and in the cloud. Learn more. Planning for your email archive migration is half of a successful migration. Learn how you can best plan for it and find the right path for your unique project with this eBook! What are some of the concerns you should look out for when migrating to Microsoft Exchange, on-site Exchange Personal Archives and Office 365? Download this datasheet to learn more. Successfully migrating archived email data with complete data sanctity can be extremely challenging. How to migrate your email archives from any source to any destination with trust? Download this datasheet to learn more. Download this whitepaper to guide you through key issues when planning a cloud migration so you can achieve migration success every step of the way. Learn more. Read this paper, to learn how penetration testing tools can help you find out where you are weak by following critical steps beginning with planning what, when and how testing will be done. Learn more. Artificial intelligence, machine learning, robotic process automation, and a renewed role for CRM are the big trends this year. Our January Megatrends installment always provides an interesting measure of the zeitgeist among thought leaders, solution providers, end users, and media coverage, but this year all indications point to 2019 bringing an explosion in the practical applications of smart, self-learning technologies. Learn more. Read this Redmond Tech Talk to find out about technology that provides security in the cloud with one holistic viewpoint into workloads in Azure, private clouds or physical datacenter. Learn more.